In cooperation with EMIS, our computer supplier, we are providing a service that gives patients internet access to the practice. You can book, cancel or check your appointments, order repeat medication and update your personal details online. 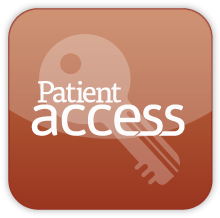 You can also use Patient Access Online on your mobile with free Apps to download for Android and iOS. Currently only a limited number of routine GP appointments are available to book online. We can only offer this service to patients who are over 16, already registered with the practice and come in to reception themselves to collect the necessary paperwork. Before you are able to use this service, you must first have access to your personal registration information. To obtain your registration information, come into the Surgery in person with photo-ID (eg Passport or new-style drivers licence) and ask the receptionist for your Patient Access online registration details. The form you are given will contain information you need in order to register. Log on to Patient Access and follow the on-screen instructions. Make sure you enter your personal details in exactly the same format as on the registration form. If the information does not match, your registration will not be accepted. You will be given a User ID and asked to create a password, both of which you will need to remember in order to log in to the service in future. If you need more detailed guidance on how to register please ask at reception. Only you can see the personal information you enter. The website is administered at a remote high-security site managed by EMIS, not at the practice, so there is no possibility of unauthorised access. Using the most up-to-date version of your web browser also improves security of information. Remember to close the browser after use, especially if someone else could access your computer.